On August 5th, the games will begin! The 2016 Summer Olympics will be held in Rio de Janeiro, Brazil. Athletes from all over the world will come together to compete in over 300 events such as; swimming, rugby, and golf! This is the first time Rio will host the Olympic Games. It has taken years to prepare for an event like this…and to help make this years event a learning experience, here are some fun, Olympic-inspired worksheets to help get you started! Tally the number of medals won by each country as you follow the Olympic Games, and then create a set of bar graphs to display your collected data. Real-world application of an important math skill. “There are 46 Athletic Events. If 24 of those events are for men, how many of the events are for women?” These math word problems all have “Summer Olympics” as the theme. Two maps of Rio are included in this file with ten questions and a writing prompt that will help students explore Rio and the Olympic venues on an imaginary trip to the Summer Olympic Games. Two maps of Rio are included in this file with seven questions that will help students explore Rio and the Olympic venues on an imaginary trip to the Summer Olympic Games. 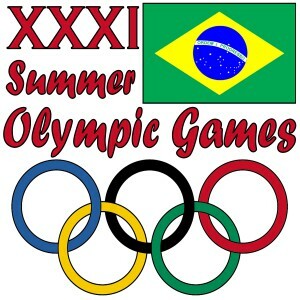 A reading comprehension that describes some of the opening ceremony for the 2016 Summer Olympics in Rio; has follow-up multiple choice questions regarding the reading. A reading comprehension on the history and symbolism of the Olympic rings. Complete with comprehension questions, and design your own Olympic emblem. Make your own ‘Did You Know?’ Olympic note cards with colorful rings, and room to write fun facts. Easy reading comprehension about the 2016 Summer Olympics with 3 short response questions. A set of “Classroom Olympics” goal pages in each subject. Printable gold, silver, and bronze medals to go with the unit; all one easy download. Students must complete each page of their individual goals. One page biography on Olympic Gold Medal swimmer, Michael Phelps, with multiple choice and short response questions. Instructions for individual or group work. Fun, summer Olympics report packet includes a sports survey, map of events, design your own uniform, and other creative ideas. Great for all ages! Find all of the Olympic-themed vocabulary words in these brand new word searches! Simple and fun, Olympic Medal tic-tac-toe game board. Print out these colorful Olympic Rings desk tags to use in the classroom. 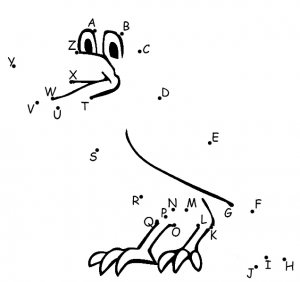 Print and color these worksheets to display throughout the classroom or home. We hope you are enjoying your summer so far! Be sure to check out abcteach for updates, new materials added daily, as well as current promotions! And don’t forget to sign up for our FREE newsletter to stay up to date on teaching resources. Earth Day is celebrated every year on April 22nd. We should celebrate Earth Day everyday! How are you going to incorporate Earth Day into the classroom? Well, look no further…we have some great activities to get started. We want to focus on the importance of protecting the environment, as well as ways to prevent more damage from occurring. Let’s start off on the right foot by reducing the waste we make each and every day. Instead of printing paper, Go Green! Recycling paper can save money, as well as our planet! You can immediately start reducing your carbon footprint with these helpful tips and tricks to try today, and why not start on Earth Day. Teach your students/children how to recycle early. It can be confusing, what is recyclable and what is not. Recycling is a great way to reduce pollution, conserve energy, and save important natural resources. Here are a few ideas to help recycle paper use in the classroom. Use both sides of sheet paper when writing in the classroom, and printing large workbooks. Work in groups to save on printed handouts. Create a scrap paper bin for students to use whenever! Use chalkboards/whiteboards to save paper. Create a blog or website for students to access and submit assignments online. 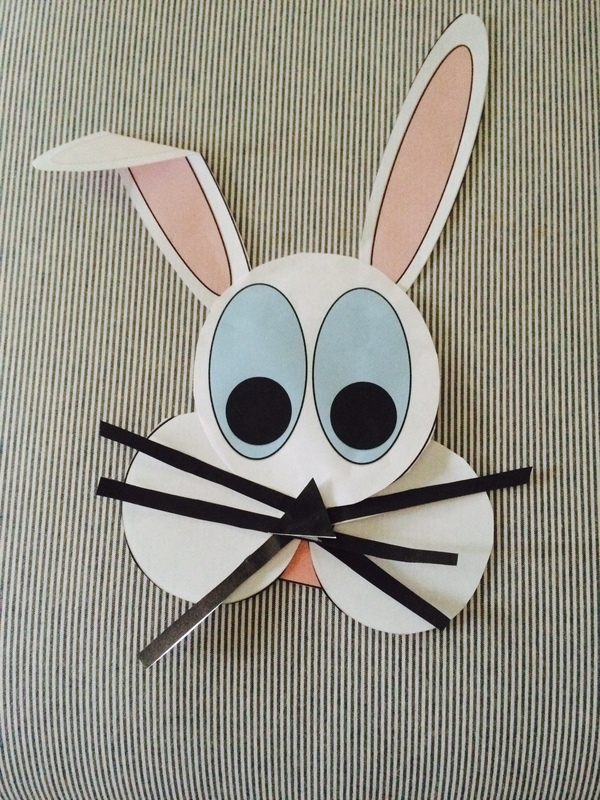 Recycle old magazines, newspaper clippings, and mail to create cool art projects. Do you have any other ‘green’ classroom tips that you can share? Feel free to leave a comment on how you are helping reduce waste in your classroom. To refresh your comprehension skills, we have many different articles about Earth Day and how it all began. Did you know that Earth Day was originally started in San Francisco in 1970? We have a few awesome interactive activities to use in the classroom on Earth Day! Don’t have a SMART Board? No problem, just open the file using Smart Express Viewer. Other activities that help explain the three R’s of conservation (Reduce, Reuse, and Recycle) are linked below. There are so many fun, hands-on ways to teach green in the classroom. This is a great time of year to show your students what they can do to help save our planet. There are so many ways we can protect the environment and help save the planet. 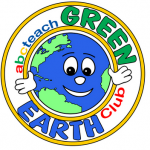 Teaching the importance of going green in the classroom, and encouraging our students to be environmentally conscious every day and not just Earth Day is a wonderful start. You can make a difference by Going Green! Have you ever wanted to be able to use abcteach resources directly on your computer or tablet without having to print? Well, now you can! 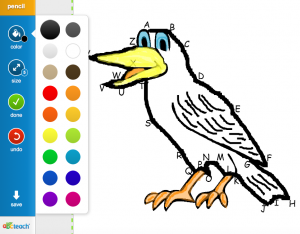 With abcWorkshop you can bring up any PDF on the site to draw, color, and write using the custom tools. This is only being offered to our members. If you are a free user you can test it out using the free templates on the site. Here is a simple tutorial showing how you can use abcWorkshop and what benefits it has to offer for you and your students. Let’s get started with something simple. AbcWorkshop is easy and fun to use! 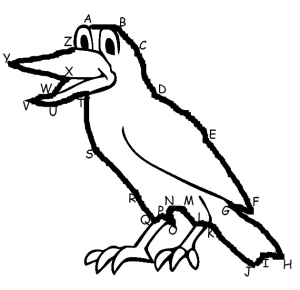 If you are following along, we will be using the first Dot-to-Dot example on the FREE site. Click here to get started! Bring up any PDF document by selecting the blue drop down box, and choose, “Open in abcWorkshop.” This will open a new screen with your selected file. You will see a list along the left-hand side of the screen. This shows all of the customized tools you can use. Select the pencil to connect the alphabet dots! Starting with the letter A, and ending with Z. You have 18 different color options to choose from. We used a black outline for the crow, once you have connected all the dots, now color it in and add your own personal touch! After every tool, select done. Select the marker to color as well as the size of thickness. You can easily change colors and size as you go. Get creative, and have fun! If you want to add solid lines you can use the pencil and if you want to highlight or fill in the lines, use the marker tool. Make a mistake? No worries…just select the red ‘undo’ button and it will clear the previous edit. Want to write out a story or poem on this page? Select write in the upper left-hand corner, and choose a font. You can update the text at anytime. When it is selected, a green dotted-line will appear around the text box. Press ‘done’ to finish. For all of our FANTASTIC abcteach members, you have unlimited access to every PDF on the website. Here are a ton of great activities to try right now using the abcWorkshop! There are so many different possibilities using abcWorkshop! I hope you found this tutorial helpful. We would love to see what you are working on. Use the hashtag #abcWorkshop on social media and facebook so everyone can view your work. The holiday season has passed and 2016 has arrived. For teachers, homeschools, and parents it is time to get organized and look forward to another great year of educating your children. There is an increasing amount of information being thrown at our students and us today. With the overuse and abundance of social media communications, new technologies and educational concepts, it is important for us to stay organized on what we should be teaching. Don’t worry abcteach is here to help. Here are some helpful tips on how you can be prepared for the year ahead. We all have a certain way that we like to teach, and most of the time the point gets across to our students. However, it is important to challenge yourself as an educator and try new things in the classroom. Abcteach has many helpful categories such as Teaching Extras, Homeschool and Parent Resources, and Fun Activities where you will certainly find something new and exciting to try in the classroom. School can be long and excruciating if the right energy is not in the classroom. We want our students to learn and behave respectably, but we can’t expect that to happen automatically. Engage your students in the lessons you are teaching. No matter what the objective of the day is; classroom work, group work, video & write up, a quiz, it is important to communicate with as many of the students as you can on a regular basis. It will grab their attention and keep them attentive. Have your students accomplish more than one task during each class period. This will help them refocus and keep them awake! * Get Back To Basics! When all else fails in the classroom or at home, we need to take a hard look at ourselves and assess how to accomplish a better teaching environment for all the parties involved. When this happens, get back to basics! Make sure to take advantage of our abctools (custom worksheet generators). Make quick worksheets for the classroom! Members can save their abctools and refer back to them at anytime. This is one of the best ways to create basic templates for all your teaching needs. Theme Units and Thinking Skills (member category) will help you find something to get your classroom or household on the straight and narrow as well. *** Make sure to take advantage of our current New Years Special ! 50% OFF 1 & 2 year memberships. That’s only $20 a year ! Become a member today ! Let 2016 be your best year yet! One,Two, buckle my shoe…Three, four, new rules do more! Now that classrooms are organized and ready, well just about, and the professional development meetings are over, for now; all that seems to be left is to fill the classroom with eager, energetic students ready to take on a new school year. Just remember, these new students are coming to you fresh off of summer camp fun, late night sleepovers, and erratic schedules. In other words, your new students are in dire need of structure and a regimented set of classroom rules. Many educators develop their classroom norms or rules before students even step foot into the classroom. These are usually simple rules that students should follow to create an “ideal” learning environment. Though at times this may be successful, students do not have any say or ownership in the environment they will be learning and socializing in for the next 10 months. This can lead to frequent problems and behavioral issues. Try instead asking your students for suggestions the first day or two of school. For instance, brainstorm a list of the students ideas on large chart paper or the front board. Once the list is compiled ask students, if old enough, to vote on the top 6-8 rules to respectfully follow for the school year. For younger students, pick the top 5 and create a classroom poster with all the classroom norms and have each child sign the poster to display. For older students you can do the same or create a more complex personal contract for each student to sign. You can give the students a copy and keep one for yourself to refer back to if needed. Don’t forget…Having the classroom norms visible for students of all ages creates a set of boundaries and rules that students feel connected to and are able to reference easily. Happy rulemaking not rule breaking! Filed under: General | Comments Off on One,Two, buckle my shoe…Three, four, new rules do more! Ready or Not… Here they come! Whether you have begun your first few weeks of school or are anticipating the ceremonial hand off of your class list, school is in the forefront of your mind. With Professional development days ahead of you and classroom organization needed, time and efficiency is of the essence. Don’t stress! abcteach is here to help! These next few weeks can go by in a flash so be prepared with these five simple and helpful tips when you head into your classroom. Pick a few colors, one common classroom theme, bold, readable print, etc. Remember, you are trying to gain the students attention not distract them during lessons. abcteach has a number of different ideas to help spark a new theme for your classroom in the back to school section. I promise.. it is ok.
Let the students have ample space to display their own work and thinking in the classroom. Not every wall needs to be filled with cutesy teacher-made displays. It is acceptable to have areas not covered the first few days or even weeks of school. Put up cute “Under Construction” signs or “Students thinking coming soon” on blank bulletin boards. Parents and students alike will appreciate the opportunity to help shape the learning environment. 3). Do it Now! Don’t wait! If you have a few extra moments, which I know can be hard to imagine with professional development, meetings, and classroom readiness for students; try to declutter now. Organize your books, label the manipulative bins, and clean out that classroom junk drawer you have been meaning to do for years; once school gets going you won’t have the time. Check those items off your mental checklist and ease your mind even before your new students walk in the door. 4). Make THREE extras of everything and leave them blank! You never know when you are going to get that “new” student added to your class list. Instead of trying to remember every detail you need to copy and label, have it ready to go. Laminate what needs to be done along with your class set and put all the blank extras in a safe place. You will save yourself from a lot of stress and time in advanced. Even if you don’t get any late joining students, you now have a head start for next year or this year when that student spills milk over everything in a two mile radius. Don’t forget you can create your own custom Desk Tags for your new class too! Its easy with our Desk Tag Generator, part of abctools® and every abcteach membership. Take a risk, step out of your comfort zone. Even veteran teachers need to spice things up! Whether it is changing your classroom theme after 15 years or starting the first day of school with a new “getting to know each other” activity; try something new and have fun. Filed under: General | Comments Off on Ready or Not… Here they come! New Member Feature abcWorkshop ! 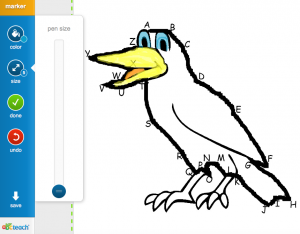 Draw, Write, Color & Create Shapes using abcWorkshop ! 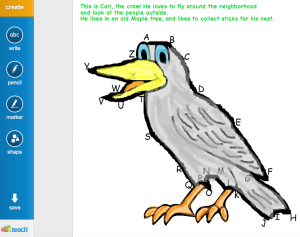 abcWorkshop is a new online editor, enabling members to draw, write, color, create, save, print, and share using abcteach pdf documents as their template for creativity. 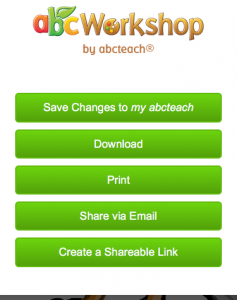 Now, for the first time all of our pdf documents can be edited through abcWorkshop on your tablet or computer. Save your creation for another day, print and share with a friend or family member, teachers can send any document to their students, as long as the link to the document is provided. Your students will be able to receive a given assignment, edit with the abcWorkshop tools, and send back to you once the assignment is complete. This is a member feature only, however, free users can demo the abcWorkshop. Here are instructions on how to craft your own bunny. Click on the link below for printouts. 1. Download the document and print out the patterns to create your bunny. 3. Paste the face and ear patterns together. 4. Add the cheeks, then the nose and mouth of the bunny. 5. Finish by adding the whiskers. Optional: Pipe cleaners can be used for whiskers. 6. Be creative ! 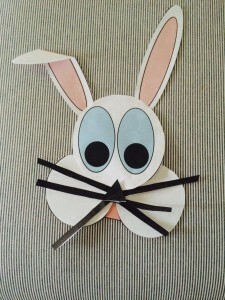 Color, paint and glitter the bunny to customize your project. Create your own daisy by tracing a CD, then draw in the petals and stem of the flower. 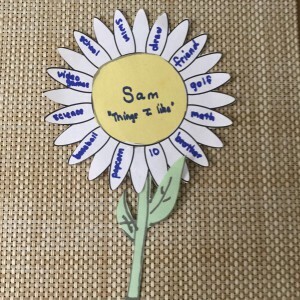 The daisy pattern can be used for many activities throughout the school year. goals — these could include: schoolwork, sports, behavior, etc. • Put a multiplication fact in the center and numbers on the outer ring. Multiply and put the answer in the center of the petal. – White or color of your choice card stock. – Colored paper or card stock. 1. Cut out a heart pattern. 2. 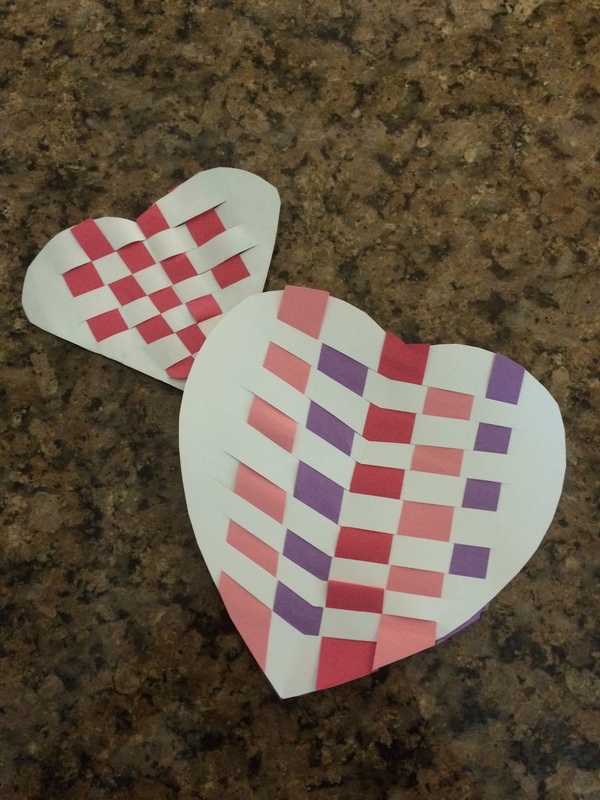 Fold heart in half. 4. Weave strips in over/under pattern. Trim around edges and glue.